Immunohistochemical analysis of paraffin-embedded human tonsillitis tissue slide using 17952-1-AP (PD-L1/CD274 antibody) at dilution of 1:600 (under 10x lens) heat mediated antigen retrieved with Tris-EDTA buffer(pH9). 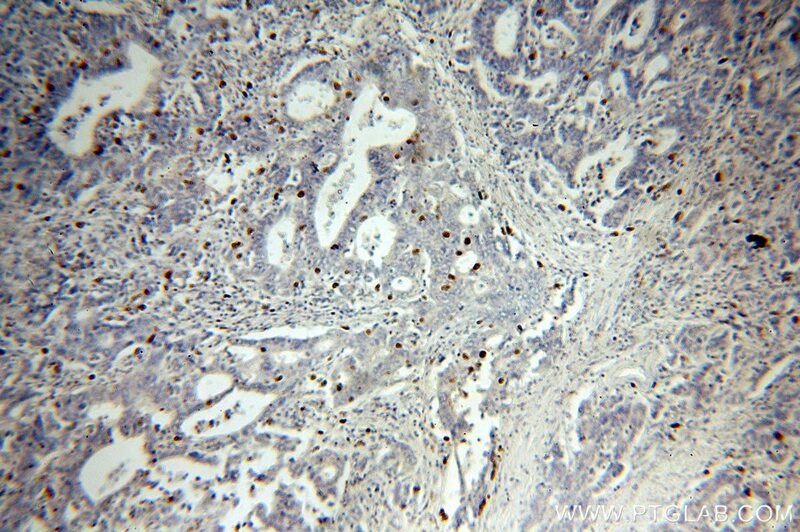 Immunohistochemical analysis of paraffin-embedded human tonsillitis tissue slide using 17952-1-AP (PD-L1/CD274 antibody) at dilution of 1:600 (under 40x lens) heat mediated antigen retrieved with Tris-EDTA buffer(pH9). 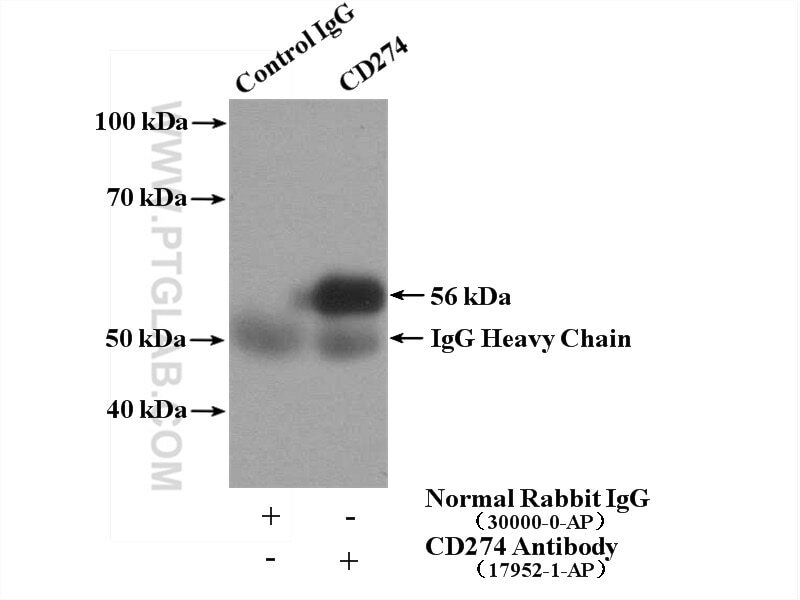 IP Result of anti-PD-L1/CD274 (IP:17952-1-AP, 4ug; Detection:66248-1-Ig 1:1000) with mouse heart tissue lysate 4000ug. 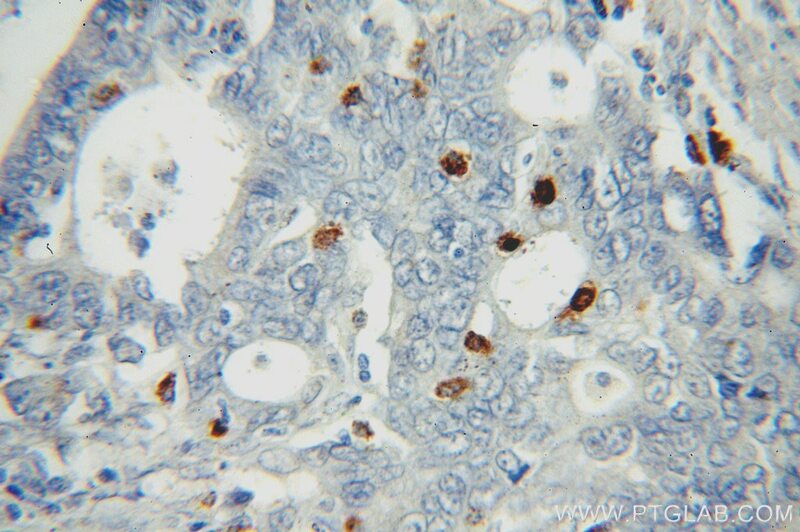 PD-L1, also known as CD274 or B7H1, stands for programmed cell death ligand 1. 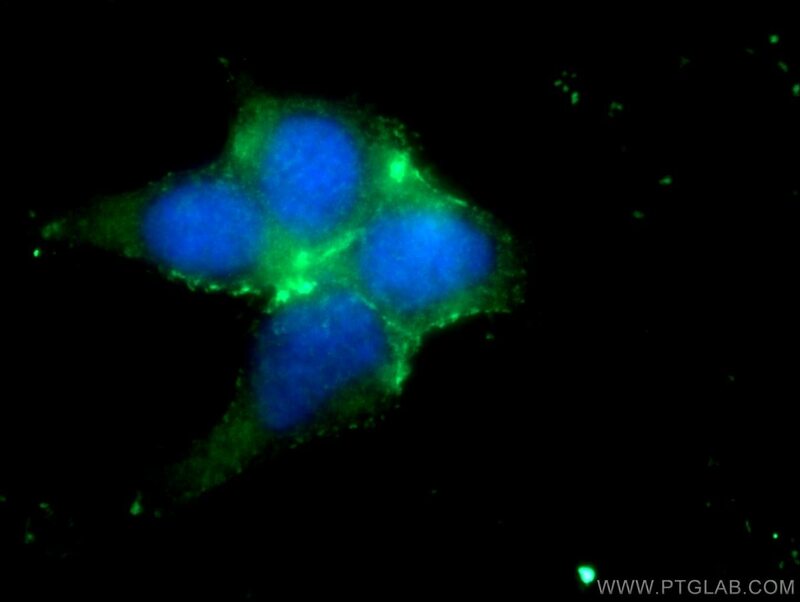 It is a type I transmembrane protein that is thought to repress immune responses by binding to its receptor (PD1), thus inhibiting T-cell activation, proliferation, and cytokine production. It contains V-like and C-like immunoglobulin domains. 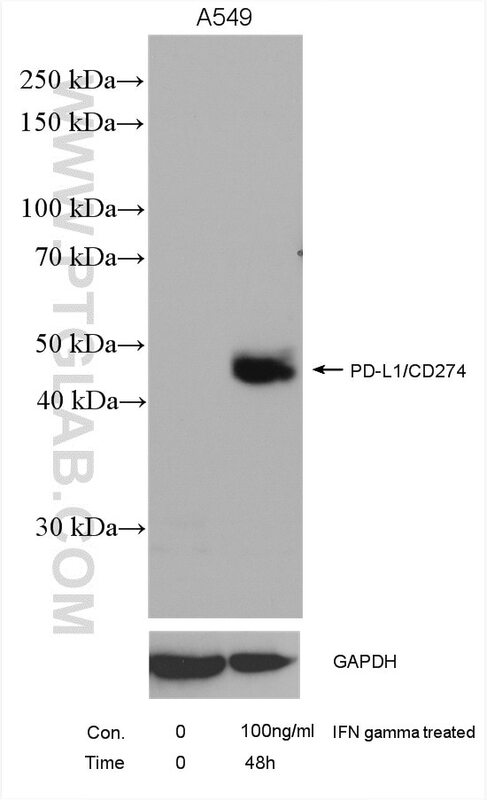 PD-L1 expression is regulated by various cytokines, such as TNF-α or LPS (ISSN: 1848-7718). Increased expression of this protein in certain types of cancers, e.g., renal cell carcinoma or colon cancer, correlates with poor prognosis. What is the molecular weight of PD-L1? Depending on the isoform, the calculated molecular weight of the protein varies between 20 and 33 kDa (176–290 aa). What are the isoforms of PD-L1? According to NCBI, three different isoforms have been identified. There are significant differences in the untranslated and protein coding regions. 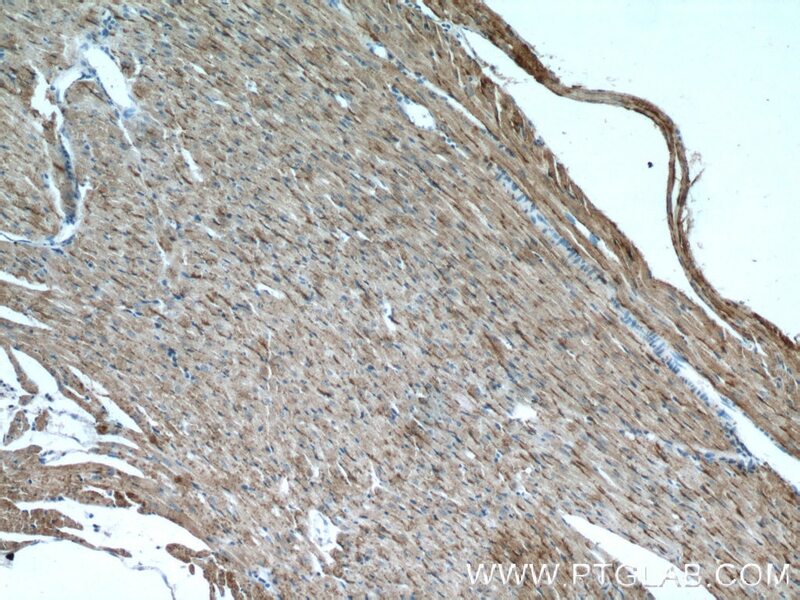 What is the subcellular localization and tissue specificity of PD-L1? It is predicted to localize in the plasma membrane of various cell types, with a particularly high expression in placental trophoblast and subsets of immune cells. 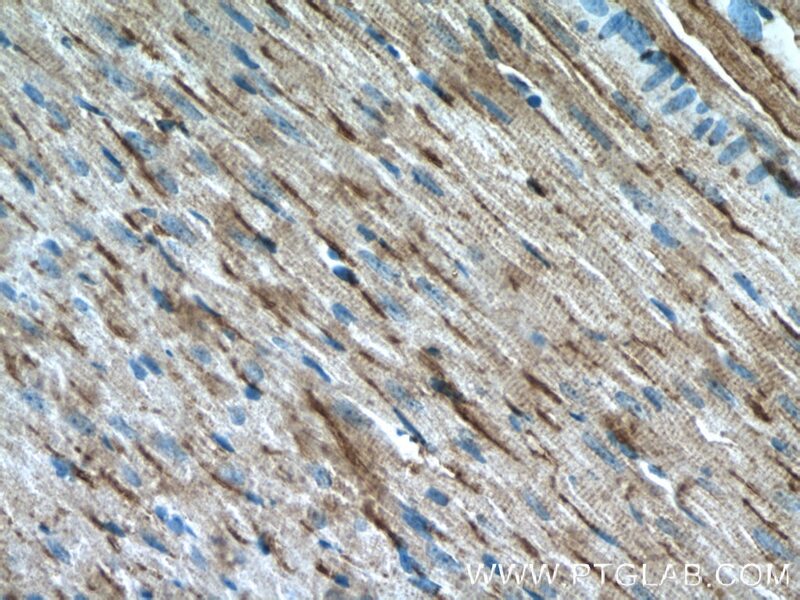 High levels of PD-L1 protein have also been detected in lung and colon tissues. What is the function of PD-L1 in immune responses? PD-L1 is critical for the induction and maintenance of immune self-tolerance during infection or inflammation in normal tissues. The interaction of PD-L1 and its receptors is responsible for preventing auto-immune phenotypes and balancing the overall immune response in situations such as pregnancy or tissue allografts. The interaction between PD-L1 and PD-1 or B7.1 starts an inhibitory signaling cascade, which results in the decreased proliferation of antigen-specific T-cells and increased survival of regulatory T-cells (PMID: 15240681). How can PD-L1’s implication in cancer be used as a drug target? 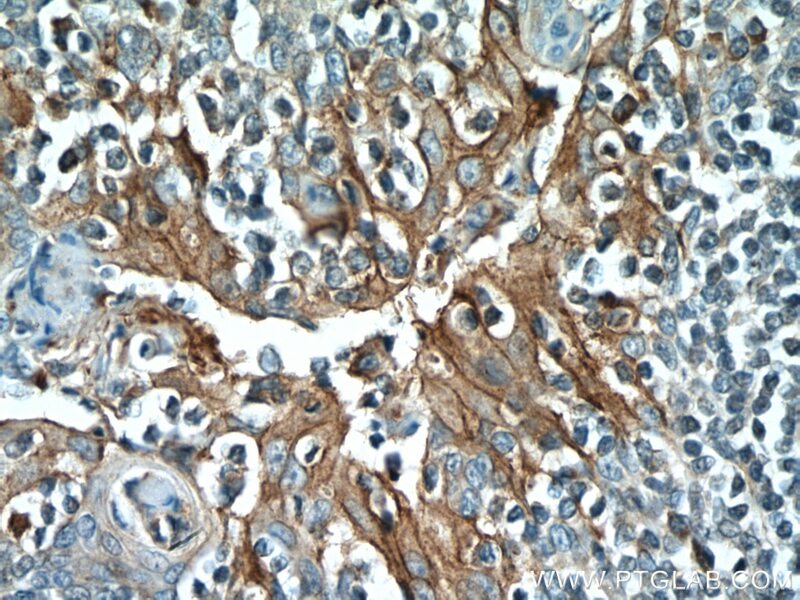 In certain tumors, high expression of PD-L1 serves as a stop-sign to inhibit the recognition of cancer cells by T-cells (PMID: 23087408). 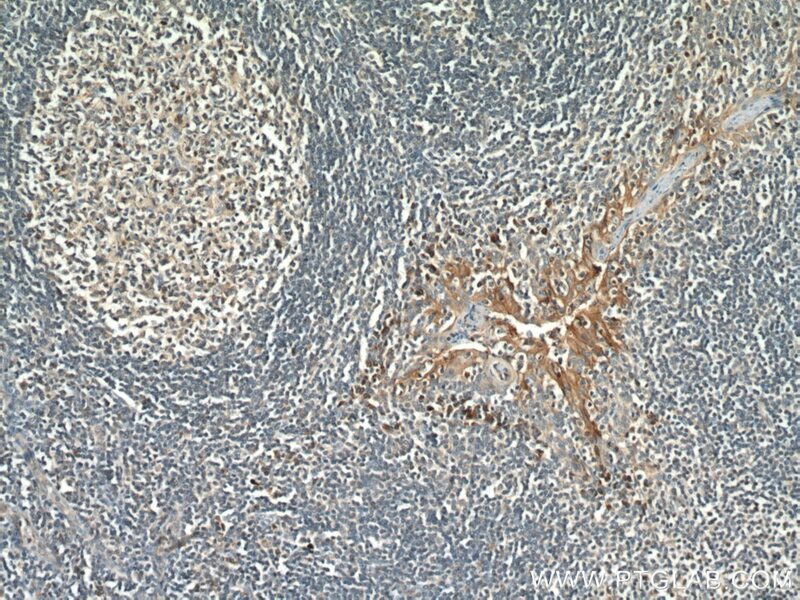 The interaction between PD-L1 and its receptors (PD1 and B7.1) is a mechanism for the tumor to evade the host immune response (PMID: 29357948). Several mAbs have been developed to target that interaction and thus prevent the inactivation of cytotoxic T-cells by the tumor (PMIDs: 23890059, 18173375). Programmed cell death-ligand 1 expression in surgically resected stage I pulmonary adenocarcinoma and its correlation with driver mutations and clinical outcomes. Role of programmed death ligands in effective T-cell interactions in extranodal natural killer/T-cell lymphoma. Immunological markers predict the prognosis of patients with squamous non-small cell lung cancer. Assessing the Effects of Concurrent versus Sequential Cisplatin/Radiotherapy on Immune Status in Lung Tumor-Bearing C57BL/6 Mice. Programmed cell death-ligand 1 expression is associated with a favourable immune microenvironment and better overall survival in stage I pulmonary squamous cell carcinoma. 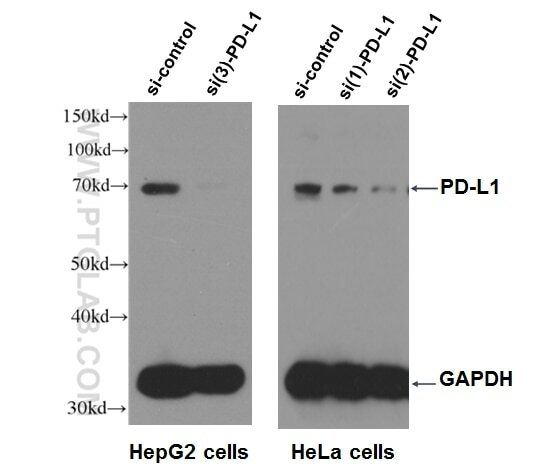 High co-expression of PD-L1 and HIF-1α correlates with tumour necrosis in pulmonary pleomorphic carcinoma. 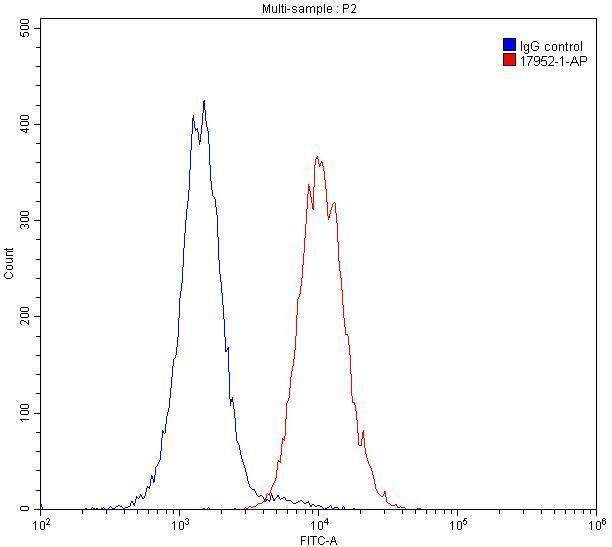 WB result of PD-L1 antibody (17952-1-AP, 1:500) with si-Control and si-PD-L1 transfected HepG2 and HeLa cells.